scanned PDF documents to editable text files. 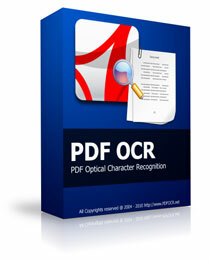 Download PDF OCR Now! Editable - Edit Scanned PDF Documents like editing a text file! Easily - OCR PDF To Text Just In Only 2 Clicks. Fast - PDF OCR has a fast OCR engine, 92% faster than other OCR software. Page Selection - OCR single, range or all pages at a time. Over 10 Languages Supported - Besides English, PDF OCR Also supports German, French, Spanish, Italian and many Languages else. PDF OCR will process 10+ pages in 45 seconds. PDF OCR supports 3 PDF OCR modes, single page, page range and All page ocr(batch). Besides English, PDF OCR Also supports German, French, Spanish, Italian and many Languages else. The PDF OCR software is rather common these days and it is based on extremely useful OCR (Optical Character Recognition) technology. Its work is to turn PDF documents and paper books into an editable electronic text file. The tool is super quick and easy to use. Even if you lack Microsoft Word, you can edit your converted OCR text via a built-in text editor. Just like several other PDF tools, the OCR application offers a Batch Mode that can let you process files quickly. If you have several PDF file pages, you can convert them into editable text files in an instant. To create your own scanned PDF books, make use of the tool's Scanned Image to PDF Converter. To say the least, this is one of the handiest PDF tools you should have. Having the right OS is not all; the PC has to have enough RAM and hard disk space. In this case, you need 128 RAM or more. The much recommend is 256MB RAM. Second, you need 20MB of hard disk space to install and store your OCR program. If you decide to download your PDF OCR program today, there are special benefits to expect. - After turning your scanned PDF files to an editable electronic file, go on and correct it. It has an integral Text Editor that can let you amend text without MS Word or WordPad. - With only two clicks, you will be able to OCR your PDF file to a text file. So the program is easy to use. - PDF OCR uses an extremely quick OCR engine that is ninety-two percent quicker than any other OCR software tool. In forty-five seconds, you can process more than 10 pages. - It offers three modes: single page, page range and All page ocr/batch Mode (enables you to convert one file or several PDF file pages at once). The fact that it can do page selection is advantageous and convenient. - The program supports more than ten languages. So, apart from English, the PDF OCR is compatible with French, Italian, German, Spanish and other popular languages. This makes the tool universally useful. - Supports any Page Size. Hence, you can OCR your A4s, A3s, B3s, B4s, B5s and other types of PDF scanned pages. We need to be honest about that the PDF OCR program doesn't only have advantages. First of all, it can't recognize text one hundred percent correctly. Hence, its Optical Recognition Technology can only recognize text from images and graphics at a RR (recognizable rate). This rate largely depends on the PDF text fonts and background among other things. Note that PDF OCR is only capable of identifying text from PDF files and that it sees images and graphics as text as well. This is why you are likely to receive some unknown characters that you can remove in your Text Editor. So, get your OCR program today and turn your PDF files into electronic files you can easily edit. OCR is abbreviation of Optical Character Recognition, which is the electronic translation of images to editable text.